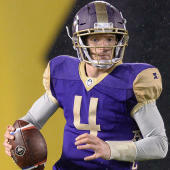 Just like that, the AAF season is in the home stretch. We're five weeks in, and in five more weeks it will be playoffs time. It goes by fast, but after more than a month, there has been enough tape to give out our midseason awards, including our All-AAF team, as well as Offensive MVP, Defensive MVP and Coach of the Year. Obviously, some of these picks will change as the rest of the season unfolds. However, in other cases, it might take a -- God forbid -- significant injury to knock certain players from their position. First will be our midseason selections for Offensive MVP, Defensive MVP and Coach of the Year, followed by our All-AAF team. No player has been more impactful and efficient for an offense than Gilbert has with the Apollos. He leads the Alliance with 1,357 yards passing -- 331 more than the next-best quarterback, John Wolford -- and averages 9.2 yards per attempt. He's yet to throw an interception and has been useful with his legs as well. Quarterbacks are always an easy choice for these types of awards, but clearly there's a premium on quality quarterbacks in the league. This is his award to lose. Summers has been among the most consistent players on either side of the ball through five games. His matchup with Charles Johnson in Week 5 was arguably the best on the field in any week, as those two could very well be doing the same thing six months from now in the NFL. Like any good matchup, Johnson won some battles and Summers won some battles. But Summers has been Pro Football Focus' highest-graded corner pretty much all season. You were expecting whom, exactly? Yes, Orlando clearly has superior players in a number of spots, but it's up to Spurrier to put them in positions to succeed. After a few years away from the game, Spurrier is reminding everyone, again, why he's one of the finest minds to ever grace the game. The Apollos continue to be the only team in the Alliance capable of consistently picking up chunk yards and scoring points. With Spurrier, Orlando's offense looks just a little bit different every week, making it unimaginably hard for which to prepare. What's more is that Orlando has been favored in all five of its games, covering in four of them. As the only undefeated team left, how it could it possibly go to anyone else?